L.A.’s premiere roller derby queens, the Derby Dolls, in conjunction with Council Office CD13 and St. Vincent’s Hospital will be hosting their 4th Annual Community Resource Fair to Help Cultivate Healthy Life Styles for Angelenos in the Central East Los Angeles Area this Saturday August 25 at The Doll Factory. The Doll Factory is located at 1910 Temple St., Los Angeles, CA 90026 (between Alvarado and Union). Free parking is available at Silver Lake Medical Center, 1711 West Temple (near the intersection of Temple and Union), one block east of the Doll Factory. 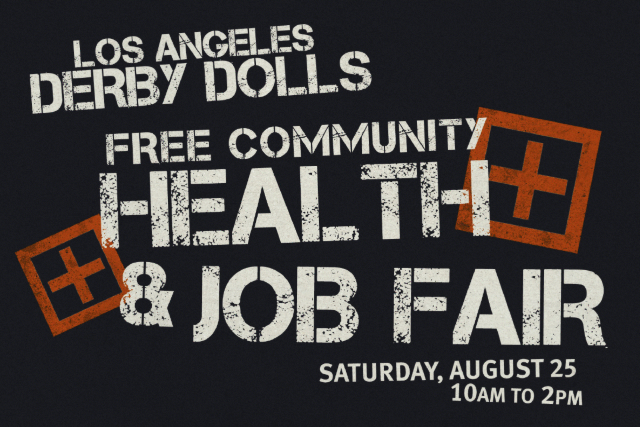 For more information about the Job and Health Fair and the L.A. Derby Dolls please visit their website. This entry was posted in Events, Health and Beauty. Bookmark the permalink.